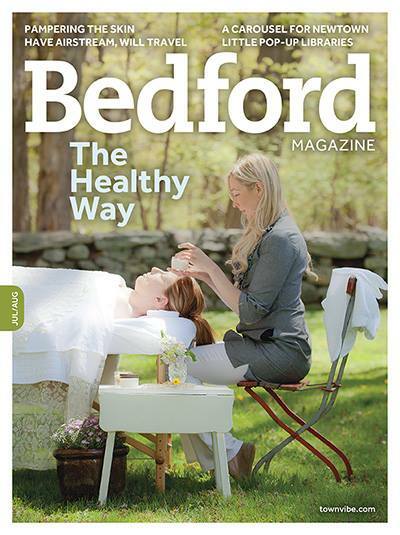 Featured cover + article in Bedford Magazine, based in New York. I am passionate about glowing, luminous skin that is healthy and hydrated. My facials are result driven and your skin will be instantly revitalized after one treatment. I believe healthy skin is youthful skin. I'm a firm believer in facial peels and exfoliation to "unglue" all the dead skin cells to reveal bright, beautiful skin. Whether your desire is to reverse the signs of aging from sun damage with a natural facial peel or restore and hydrate tired lack luster skin, I will create a facial treatment designed specifically for you. Your facial will always begin with a full skin analysis followed by an hour long relaxing treatment including a double cleanse, exfoliation, facial steam, customized mask, eye treatment, and concluded with a facial and décolletage massage. A facial peel may be added to any facial treatment for an additional charge with little to no downtime. This hydrating antioxidant facial gives the skin a boost of energy with 100% pure Vitamin C to repair signs of premature aging, stimulate firming and plumping, while restoring elasticity. (strongly suggest pairing with the Vitamin C facial peel for optimal results). 60 minutes/$100.00. With add on peel $ 130.00. Lift your skin to a new level of health with a custom facial peel to combat hyper pigmentation, acne and fine lines and wrinkles. Each peel is customized using powerful antioxidants and corrective peptides to create an exclusive blend of exfoliating agents to regenerate and restore your skin using natural ingredients with medical effectiveness. The right brow shape will frame your face and brighten your eyes. I skillfully train your brows to have a more shapely arch to enhance your face. Want a more defined brow? Try a brow tint, custom mixed hair glaze is used to create the appearance of thicker, fuller brows. A well shaped brow is like having a mini eye lift. I serve clients in Chapel Hill. Appointments are required to be booked in advance to ensure the best time and dates to meet your personal needs. All appointments will be confirmed 48 hours in advance. I kindly request a 24 hour cancellation notice if you need to reschedule. Cash, check, Venmo and all major credit cards are accepted.